100sareepact | Not the garden variety…. 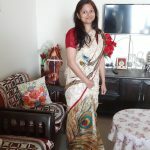 Birds on a string, painted on this black cotton saree….quirky for sure, my new acquisition. Its thick cotton but drapes just fine. Bought it after I saw my friend Divyani with a white version of this!! Here i am with my friend Tazeen who was co-organizing a talk show hosting author Neelima Adhar. Its pretty rare to see Tazeen in saree and she was looking ravishing in this cream colored cotton silk. So I made use of the opportunity and got us clicked. Birds of a feather flock together – this time on your black and yellow saree.